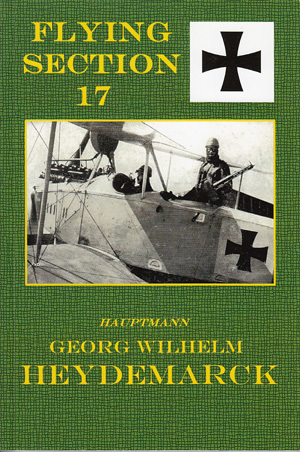 Georg Wilhelm Heydemarck was an officer in the 47th Infantry Brigade at the outbreak of the First World War in August 1914, and saw action in the Champagne region of France that same year. In 1915 he applied to join the Air Force as an observer, and received training as an observer at Gotha and Grossenheim. On completion of his training, he was transferred to Flieger Abteilung 17, based at Attigny in France. He served with this squadron until December 1916, at which time he was promoted and transferred to Macedonia, there to take command of Flieger Abteilung 30, stationed at Drama on the Struma Front. After contracting malaria, he was transferred once more to the Armee-Oberkommando (AOK) staff, in September 1917. After the war, Heydemarck resigned his commission and studied economics at the Universities of Leipzig and Rostock. In 1933 he returned to flying, joining the German Air Sports Federation (DLV). Between the wars he wrote a number of books about his service in the Air Force during World War One, three of which were translated into English. This is the second of those translations, Flying Section 17.